The biggest absolute emissions come from China and the United States. 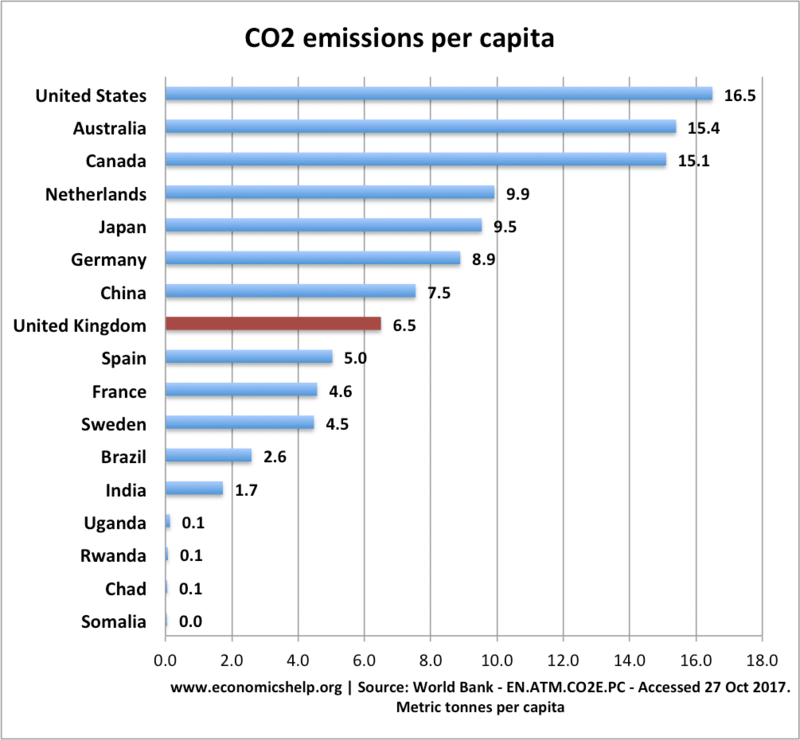 In terms of CO2 emissions per capita, China is ranked only ranked 47th, at 7.5 metric tonnes per capita. The US is ranked 11th at 16.5 per capita and amongst countries with sizeable populations, has the highest CO2 emissions per capita. India is the third highest country in terms of absolute emissions, but only 158th in terms of per capita output with 1.7 metric tonnes per capita. What explains variation in CO2 emissions per capita? Levels of GDP. Countries with higher real incomes can afford to use more petrol and industrial production which causes pollution. By comparison, the lowest income countries have very limited industrial production and consumption of oil. However, that is only one factor, for example, the Netherlands has double CO2 emissions than France with similar GDP per capita. Focus of the economy. Economies based on oil (like Qatar, Bahrain and United Arab Emirates) have the highest levels of CO2 per capita. Qatar has a rate of 45.4 (off the chart) – small population but production based on oil exploration and oil refining. Policies to reduce CO2 emissions. To meet global warming targets countries have adopted policies, such as carbon tax and regulation to reduce pollution. Modes of Power generation. The burning of fossil fuels (e.g. coal-powered electricity stations) is one of biggest causes of CO2 emissions. Countries which gain energy from renewables have lower CO2 emissions per capita. 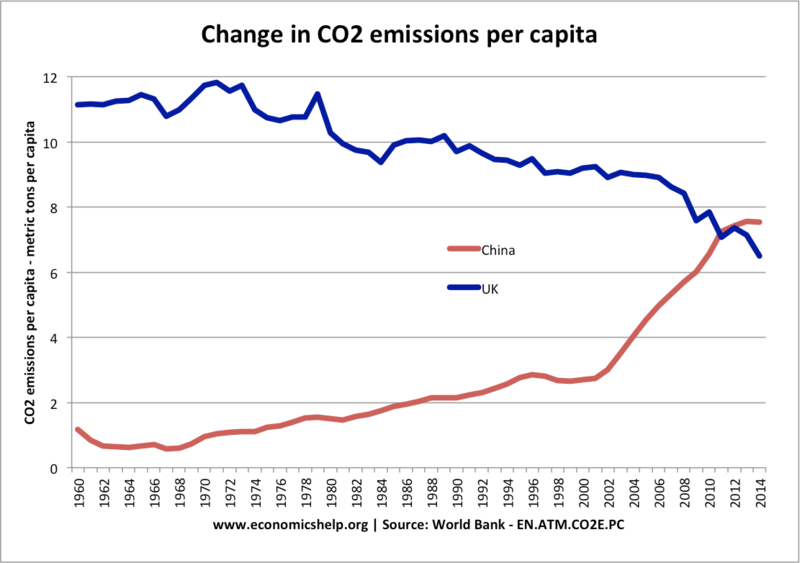 China’s CO2 emissions per capita have more than tripled in past 15 years. The total level of CO2 emission by kilo Tonne. Readers Question: Why don’t countries use the carbon tax? Taxes are generally politically unpopular. A tax on carbon emissions will affect the living costs of many people. This can make the government reluctant to impose the tax. There is also the free rider problem. A small country may think – what is the point in introducing carbon tax when their CO2 emissions are dwarfed by other countries like China and the US? Especially, when these bigger countries don’t seem inclined to do too much about the issue. There are also differing opinions about the potential cost of CO2 emissions to the environment. In the US, there is a strong lobby which argues global warming is not scientifically proven. Therefore, there is a resistance to impeded CO2 emissions. Another factor is that there are significant vested interests in the oil industry / other industries which pollute. They fear CO2 tax will reduce their profitability so they are willing to fight against moves to introduce taxes. Another argument used is that a Carbon tax will harm jobs. 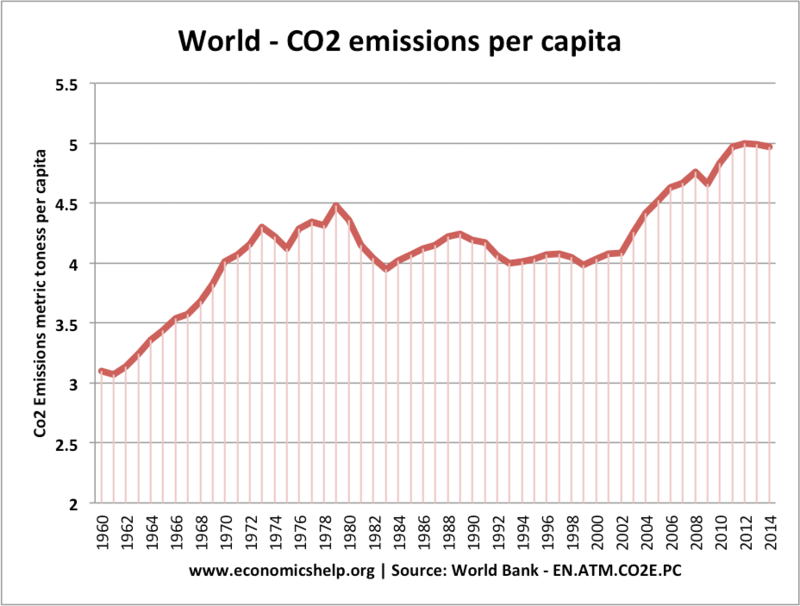 World Bank CO2 emissions per capita. This entry was posted in economics, environment and tagged pollution, tax. Bookmark the permalink. “Total emissions must be a guide” No sir. Total emission is directly proportional to numbers of active persons per country. Look at it this way, 24 litres of clean water per person per day, how much would you require for 10 people per day? Therefore emission per capita is still the correct and acceptable metrics to judge emission. Yes, you are right at all. All other statistics for the whole pollution of the country is misleading at all. The “why is there no carbon tax” section misses the real reason, IMO. Most fuel sources are subsidized by the government to stimulate the economy. Preferring one energy source over another is normally a case of shifting subsidies around – rather than taxation. An energy source would have to be very, very bad to warrant actual taxation – and few sources qualify. Both, “total emissions” AND “per capita emissions” must be a guide. First, the countries with the “largest total” have the best political possibility to make the greatest impact in reducing the pollution. Then, the countries with the largest “per capita emissions” can together make even a higher impact. I say that everybody knows this, but this has not yet gone through. This includes me and you: Start BUYING and investing in renewable energy. Use energy efficient heating/air systems, energy efficient lights, drive alone less, FLY less, buy local food, eat less meat, and so on. This will save the world and even save you money. – BUY from responsible companies and countries. – If you are running a country, or want to run a country, start using energy efficiency and reducing pollution as your weapon. Also, YOU might solve the nuclear fission problems. Study it a little. I’d note that the Chinese regard emissions per unit GDP to be important. Everyone is missing nuclear power. Countries with a larger portion of nuclear power generation will of course have lower CO2 outputs per capita. France is a good example, it has 2nd highest use of nuclear power and is about 18th globally for CO2 output. Countries without nuclear example Australia, have a high CO2 output per capita. Australia has a high CO2 output per capita because they burn coal for much of their power and drive large cars with inefficient engines, due largely to the poor sulphur content of their fuels as they refuse to update their refineries to produce fuel for more efficient engines. They have all the solar power in the world but the coal giants dominate politics. There are some hydro power schemes and the state of Tasmania has mainly hydro power. It’s not a lack of nuclear energy but contempt by politicians and ignorance of a large number of the population that keeps their CO2 levels high.